In the late ’90s I had a job that took me all around the world. I spent so much time on airplanes that I seriously thought I could be losing bone mass. See there was a study released at the time about the astronauts who spent long periods in space losing bone mass due to the lack of gravity or something. I was pretty sure that was happening to me. Even though I often traveled alone, when I went to Tokyo for nine days back then I was traveling with a colleague. We were on a mission to gain more distribution for our brand. For nine days we traveled around Tokyo meeting with retailers and securing positioning for our products. For nine nights, we checked out the hotspots and mixed with the ex-pats. 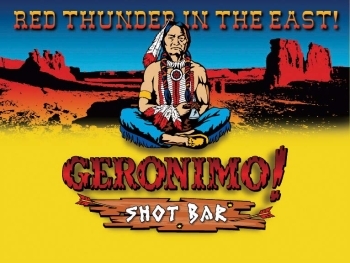 On the last night there, we were at Geronimo! Shot Bar (ex-pat hotspot in Roppongi) spending our remaining Yen. At about 11pm, we called it a night and walked out to grab a taxi to the hotel. Then the strangest thing happened…In my pocket I found 40,000 Yen. 40,000! 40,000! Such a big number, but was really only equal to about $10. Still,Yen are useless in the States and I wasn’t about to take any home. So back to the bar and when we exhausted our 40k, we managed to locate some lovely bad boy ex-pat bankers who hadn’t yet spent their per diem…bar led to bar..Roppongi never closes…And, I think I may have stumbled back to the hotel around 4am. The next morning – really later that morning – I was scheduled to take a 7:30am bus to the airport to get the only direct flight back to New York. So, I set my alarm and called for a wake up call. I’m sure both of those things happened. I was so confused and grabbed in disbelief at his wrist…Indeed, he was correct. His watch read 7:30am. I looked at him and started to cry. I hadn’t packed and my life was strewn all over the hotel room. I couldn’t miss the one direct flight back to NYC. Tears. Panic. Gasping. ‘You brush teeth! You brush teeth!’ – not too subtle hint from The General. And they did. In no more than :40 seconds the room was packed, my teeth were brushed, I was dressed and they were carrying me downstairs. They poured me onto the bus and I was off. Be prepared. Might have been a better idea to pack before going bad-boy-banker-bar-hopping in Roppongi. Yep. That might have been better. 1. 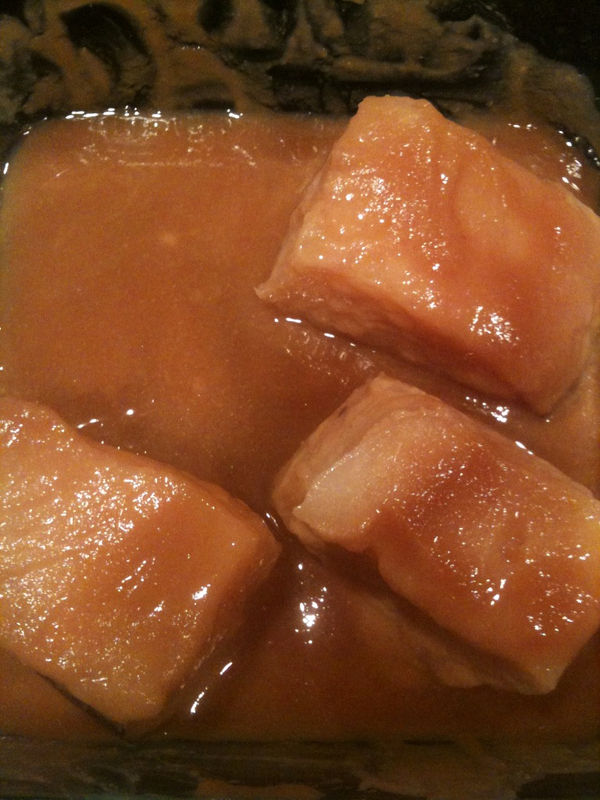 In a small saucepan over medium/high heat combine 3 tbsp of Mirin (looks like soy sauce and in the same section of the grocery store) with 3 tbsp Sake and bring to a boil. Mirin and Miso Paste may not be in your regular grocery store. I’ve found them at Fairway, Whole Foods and Japanese specialty food shops (even in the midwest). NOTE: If you have a whisk with a longer handle, use it. It’s a lot of whisking over the heat and you can burn your wrist…. 5. 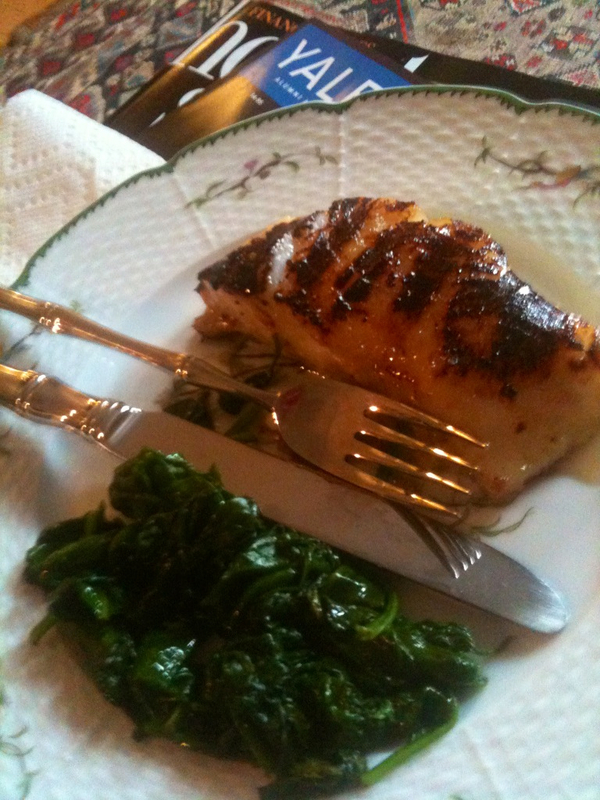 Put 4-6 7ish OZ Black Cod fillets into the marinade and spoon the marinade over the tops of each…The recipe calls for Black Cod…but, right now Black Cod is crazy expensive – like $40/lb – so the stores aren’t carrying it. You can use Sea Bass or Halibut. That’s Sea Bass in the pic. 7. Scrape the excess marinade off of the fish – it’s more like a grainy pasty cover – and place skin side up on the grill pan. Cook until the fish is browned – about 2-3 minutes. NOTE: The fish is covered in sugar. Sugar burns -OK. Sugar pops spewing burnt sugar beads all over your small kitchen – Not OK. I loosely cover the grill pan with tin foil to avoid having to pick charred sugar off of my ceiling. 9. Transfer to a plate and serve. I’m so grateful to ‘The General’ who called in the troops to Pack for Me! and instruct me to Brush Teeth! But, the tears, gasps and panic could have been avoided if I had only been prepared. The Nobu Miso Glazed Cod/Sea Bass is perfectly simple to make…if you have some time to Be Prepared.